Because when you’re baking cupcakes with south-of-the-border spice levels in them, you don’t want to complicate things. 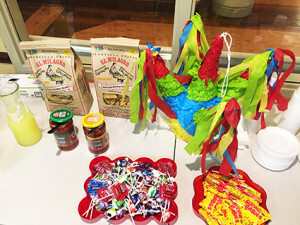 On both May 4 and May 5, Kai led about four dozen Generations at Regency residents through a variety of activities to mark the 156th anniversary of “Cinco de Mayo.” The holiday commemorates the Mexican army’s improbable victory over the French during the Franco-Mexican War’s Battle of Puebla. Way, way north of the border, the celebration took the form of salsa dancing, piñatas, “big-money Bingo” and cupcakes with Mexican hot-fudge frosting. “Hot” not meaning temperature, but spice level. Kai helped his bakers mix chili powder and raw cinnamon into their frostings. But, Mr. Activity Director, wasn’t a load of fudge frosting good enough? No, Kai reports: for this holiday, the residents wanted more. So, for each batch, they worked a half teaspoon of cinnamon and a full teaspoon of chili powder into their toppings. The group made more than they could eat, and ended up passing more out (with proper cautions) to adventurous residents throughout the building. On the actual Cinco de Mayo, residents’ family members came to Generations at Regency to join their loved ones for the dancing and games. “The ‘big-money bingo’ drew them in,” Kai said — adding that “big money,” in his building, means really nice prizes more than cash payouts.